The Research Cluster meets twice a month (Tuesday afternoons). All welcome! This presentation will focus on important issues related to analyses of longitudinal data, such as theories of change and time and disaggregation of between- and within-person processes. It will be a non-technical discussion about key concepts related to longitudinal data analysis with a special emphasis on within-person change. The Lexis diagram is a Cartesian plane defined by calendar time (P) and age (A). Birth cohorts (C) are a third and redundant alternate coordinate also defining this plane. Demographic quantities may be patterned along any of these three time measures, and such patterns may be useful for either predicting or understanding demographic processes. The APC relationship is familiar to most population scientists and considered fundamental. This temporal plane instrument may be defined on the basis of other time measures. For example, time in the labour market, time until retirement, and length of working life form an identity, and these can be used as Lexis-like Cartesian coordinates to reveal patterns over the working life course. The instrument is therefore general. I will give a condensed introduction to these concepts and a variety of suggested applications in different domains of research. Helen will present her work on educational transitions and trajectories. 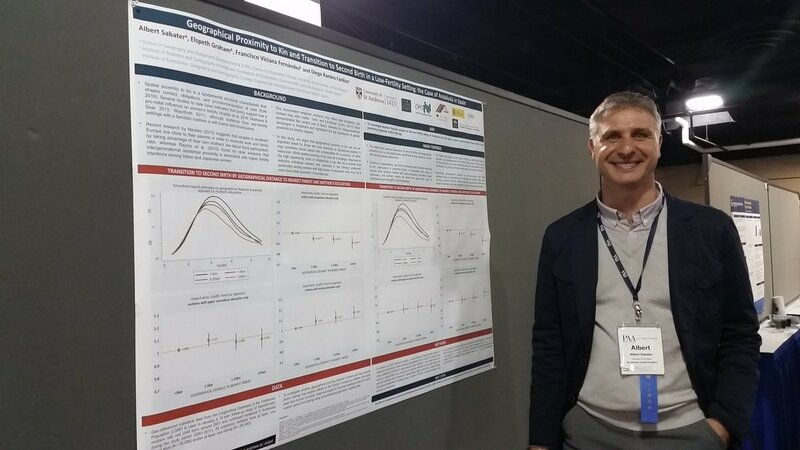 The Population and Health Research Group from the School of Geography & Sustainable Development at the University of St Andrews had a significant and successful presence at the recent Population Association of America Annual Meeting 2017. The Annual Meeting of the Population Association of America (PAA) provides a forum for demographers, geographers, sociologists, economists, public health professionals, and other individuals interested in research and education in the field of population studies. In 2017 the PAA conference took place in Chicago, Illinois (USA), April 27-29. –Parental Support and Transition to Second Birth in a Low-Fertility Setting: The Case of Andalusia in Spain; Albert Sabater, Elspeth Graham, Francisco J. Viciana, Diego Ramiro-Fariñas. Best PAA poster in the poster session 8: Fertility, Family Planning, Sexual Behavior, and Reproductive Health. –Make Up or Break Up? Union Histories of Young Adults in England and Wales; Alina Pelikh, Hill Kulu, Julia Mikolai. Best PAA poster in the poster session 2: Family Demography. Nissa Finney, Alan Marshall, Glenna Nightingale, Albert Sabater and Bozena Wielgoszewska (now at the University of Edinburgh) organised the 2017 Radical Statistics Conference in Edinburgh. Dr Allan Marshall presents at the Gerontological Society of America Conference in New Orleans and visits Dornsife School of Public Health to give a talk.